Back in January, Google unveiled an experimental feature in Google Translate called Conversation Mode, which mashed together the speech-to-text, translate, and text-to-speech features found in the app to allow a smartphone assisted conversation between an English speaker and Spanish speaker. Conversation Mode has made it out of experimental status, and has graduated to supporting a total of 14 languages. Conversation Mode now supports English, Spanish, Brazilian Portuguese, Czech, Dutch, French, German, Italian, Japanese, Korean, Mandarin Chinese, Polish, Russian and Turkish. Google does note that while the feature isn't experimental any more, it is still in alpha status, so background noise and regional accents will affect the accuracy of translation. We're assuming that means only American English is supported, but feel free to let us know if it works for any other English speakers from outside North America. The update to the Translate app also adds a feature which will allow you to correct dictation errors before translating, and the app has been optimized for tablets. And, of course you may not specifically need Conversation Mode for some shorter interactions, because Translate does support speech-to-text in 17 languages, and text-to-speech in 24 languages. 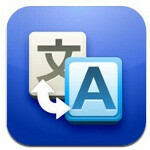 You'll need Android 2.2+ to use the app, and Translate is available for free in the Android Market. Language support like this can easily be integrated into something far beyond Siri though.